Wednesday October 25th 1893 I did some baking and other work this morning. I fixed Mrs Fuller some dinner as she could wait on herself and Will and I went over to Woolfs to dinner. It was Mr Woolfs birthday and Mary gave him a surprise party. We had a nice time. Will Reed went to Robinsons sale in the afternoon and bought a bay mare. I spent the evening in Mrs Fullers room. Thursday October 26th 1893 I got my work done up in good order this morning Mr Fullers Mother came last night to take care of his wife. I had Dentons folks to dinner. Mother came over before dinner. The girls were here awhile in the afternoon. 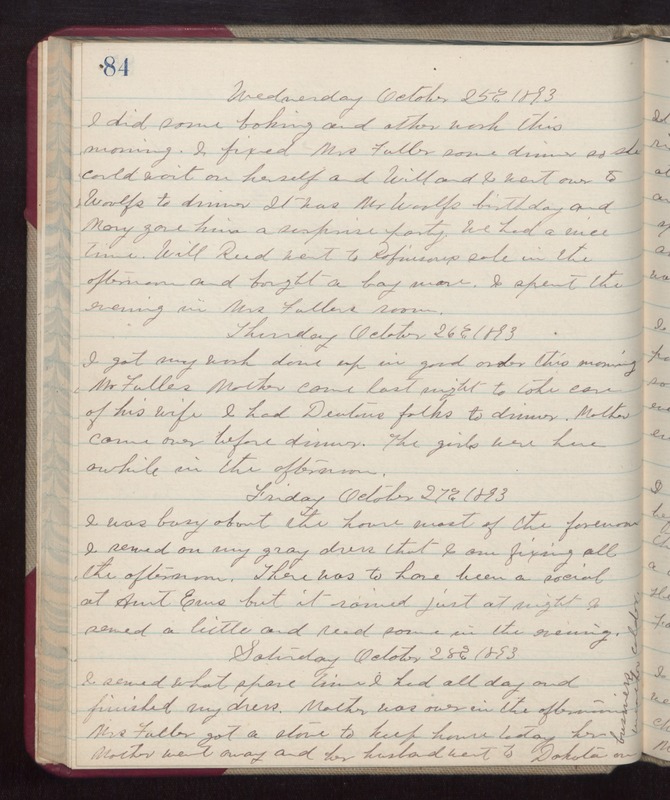 Friday October 27th 1893 I was busy about the house most of the forenoon. I sewed on my gray dress that I am fixing all the afternoon. There was to have been a social at Aunt Ems but it rained just at night. I sewed a little and and some in the evening. Saturday October 28th 1893 I sewed what spare time I had all day and finished my dress. Mother was over in the afternoon. Mrs Fuller got a stove to keep house today her Mother went away and her husband went to Dakota on business. weather colder.